Here at AniTAY Music I try to bring some of my favorite Japanese music and talk your ear off about it, but today in particular I have a favorite one that I haven’t even raved about to other authors yet because I’ve been deliberately holding myself back. This spring, one of my favorite songs was the opening theme for Yamada-kun and the Seven Witches, ‘Kuchizuke Diamond’. Unfortunately, at the time the band Weaver was only listed for me on iTunes with that one song, so I didn’t look into them much more. However, that all changed about a month ago they released their latest single, and I decided to investigate further. What I uncovered what an absolutely fantastic musical group that is now one of my favorite Japanese bands of all time. 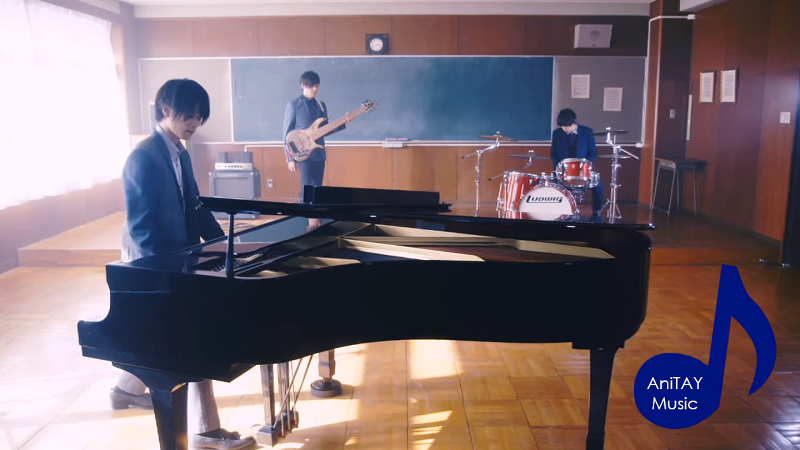 One of the reasons I’m a big fan of much Japanese music is because of the relatively mainstream popularity artists with interesting group compositions get (see also: fhana), and Weaver continues this trend by marketing themselves as a ‘piano rock band’. The group is comprised of three members, with Shouto Okuno on the bass guitar, Toru Kawabe on the drums, and the lead vocalist Yuji Sugimoto on the piano. That’s right, the singer is playing the piano while he sings. And it’s there in place of a lead guitar. Although this worked well in Yamada-kun’s case, Weaver has not appeared in any other anime so most will be unfamiliar with them and unaware of how brilliantly this group is able to pull off songs of different emotional levels. Case in point, their 2014 single ‘Kocchi o Muite yo’, the theme song for the live-action movie My Pretend Girlfriend. Although the song is already good enough, to get the full experience you need to click here or look below for the English translated lyrics to give you an idea of how brilliant a lyricist Sugimoto is. Weaver has a general trend to emphasize the piano heavily in their music, as you might imagine, and this not only sets them apart from other similar bands but also helps the emotional appeal of music in ways that a guitar just wouldn’t be able to. Many of their pieces begin with a piano solo of some sort, and their music videos often feature Sugimoto singing whole-heartedly as he plays. For the lyrics, click here. Boys & Girls actually just released last month, and the band is planning to release a new album on February 10th of next year which I suspect will include both music from Boys & Girls as well as ‘Kuchizuke Diamond’. Boys & Girls is actually an excellent example of Weaver’s ability to maintain a flow and buildup throughout a song, much like the very different ‘Mocchi o Muite yo’, as the bridge (the part of the song between the end of the second verse and the finale) is an especially strong moment in both tracks. Music for me has a much more lasting appeal when the song is strong throughout instead of just in the beginning so I’m not tempted to skip halfway through, so in this way the structure of Weaver’s music is extremely appealing for me. I love this one for the emotional and upbeat ethereal feel, which is helped substantially by the cool effects in the music video. For the English lyrics, of course, click here.